Sprocket has had a tough couple of months. The 10-month old kitten first got hit by a car and then went missing in the woods. Fortunately, Sprocket returned the next day to his owner, Fergus Fullarton Pegg, but with a broken jaw and missing front teeth. A few weeks later, still recovering from the first accident, Sprocket was mauled by a dog and on the emergency room table again. His left front leg had bad puncture wounds and nerve damage; there was talk of amputation. Working with the vet, Fergus decided to design a leg support with the Form 1+ SLA 3D printer. The support’s design had to help Sprocket put weight on the limb, to avoid atrophy and keep the blood flow strong. Fergus took a cast from the vet and designed an orthosis that would allow movement in the joint and release the front paw naturally, so Sprocket would be encourage to walk normally. Unlike a prosthetic limb, an orthosis is a temporary support brace used to help heal or correct an injury. In a weekend, Fergus was able to print the first orthosis prototype in grey resin on the Form 1+. It didn’t fit exactly, but Fergus quickly adjusted the model and printed another working prototype the following morning. Over the next couple of days, Fergus observed and tweaked the orthosis design so Sprocket could put more weight onto the injured leg. Because Sprocket is an outdoor cat, Fergus revised the cuff to minimize snagging and reduce the device’s weight to less than 20 grams. Every day, Fergus and Sprocket get up, put on the orthosis, and play with Sprocket’s favorite toy to encourage movement in the limb, while offering a level of protection. 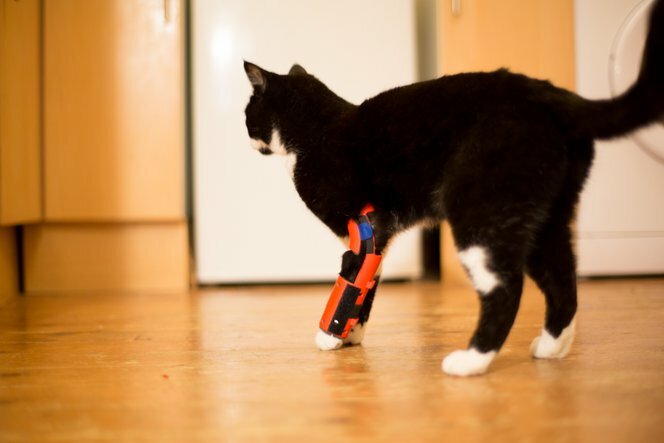 Fergus plans to reprint some of the components in Tough and Flexible Resin to ensure Sprocket has the most durable and mobile orthosis possible. Although a full recovery is still ways off, the vet has given Sprocket a few weeks with the orthosis to see how the 3D printed device will help. Wishing you the best recovery possible, Sprocket!